Learn the Dorsal cutaneous ulnar nerve reconstruction using Axogen Avance nerve allograft surgical technique with step by step instructions on OrthOracle. Our e-learning platform contains high resolution images and a certified CME of the Dorsal cutaneous ulnar nerve reconstruction using Axogen Avance nerve allograft surgical procedure. This 35 year old woman developed severe pain in the distribution of the dorsal cutaneous branch of the ulnar nerve following percutaneous K-wire placement for fixation of a 5th metacarpal fracture. By the time she presented to a peripheral nerve clinic some months later, she had non-resolving pain and diminished sensation, both confined to the same cutaneous branch territory. This was suggestive of a neuroma in continuity. Sensation on a visual analogue scale was graded at 2/10. However, she had additional features of central sensitisation including spontaneous pain, allodynia and hyperalgesia. 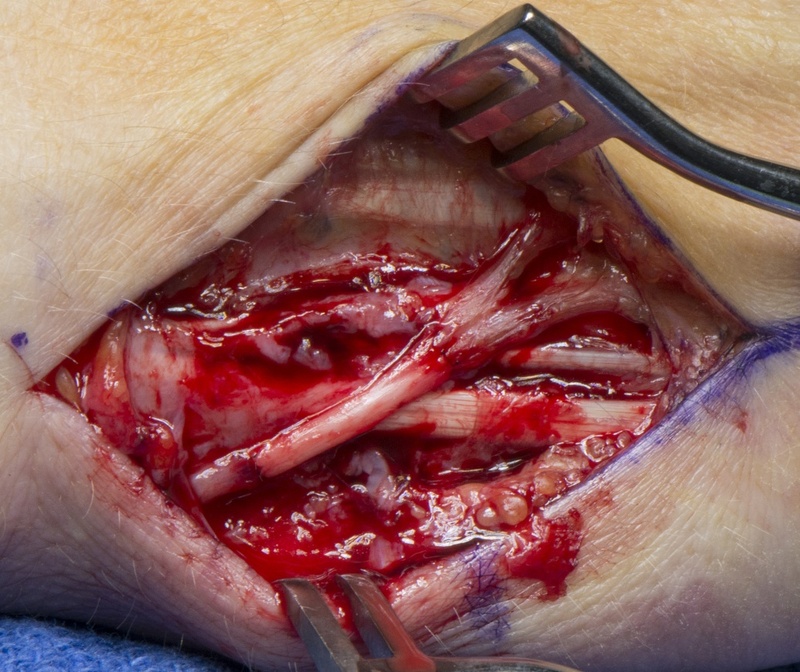 This section will cover some of the pre-operative and intra-operative decision making in treating such nerve injuries, and will detail a technique using an Axogen Avance nerve allograft to reconstruct the nerve. Scar tether around the nerve without significant injury to the intrinsic structure of the nerve. In theory, reestablishing continuity across the damaged nerve segment should restore function and minimise and contain axon sprouting whilst re-establishing normal conduction pathways, thus bringing about a successful resolution of symptoms. In practice this is not always effective or even feasible. Whether or not to reconnect a nerve is a decision that will depend on a number of factors. For example, a densely scarred bed risks non-resolution or recurrent scar tether and pain. In such scenarios, relocation of the proximal nerve stump into muscle or bone, and the use of a nerve capping devices have been advocated with varying degrees of success. However, in areas of critical sensation where the bed is suitable and the distal stump is available, nerve autograft or processed nerve allograft may be used to re-establish continuity after excision of the damaged segment. Here, allograft carries the advantage of avoiding a potential secondary site of nerve pain at the donor site in a patient with established central sensitisation. This case illustrates use of a human Avance nerve allograft developed by Axogen inc. which is processed to degrade cellular and non-cellular debris leaving behind an extracellular matrix scaffold. In the UK its use is currently monitored by the National Institute for Health and Care Excellence (NICE) and may be used with special arrangements for clinical governance, consent and audit or research.